If you like this Mock Draft be sure to check out Jordan Katz’s mock draft here, as well as the fan operated mock draft we did here. Minnesota can wait to announce their pick all they want. 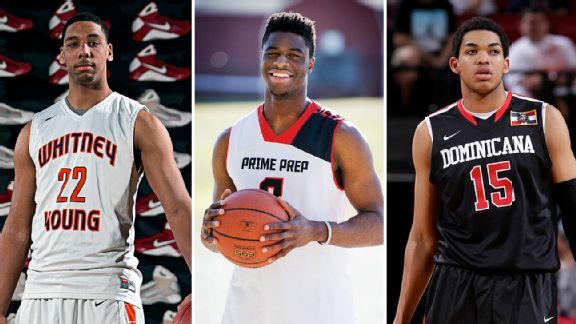 I am very confident they are taking Towns and I think its a great fit. A big man who can stretch the floor and will play defense. He will fit in nicely with their young nucleus of players. I have said all along I think the Lakers should take D’Angelo Russell with the way the league is favoring guard play, but I get why they are leaning towards taking Okafor (90/10 in favor of Okafor according to Colin Cowherd). Especially with the trade talks between the Kings heating up for DeMarcus Cousins it would make sense to draft a player at a position the Kings could only get if they acquire this pick. I want to go on the record now: I do not think the Kings are trading DeMarcus Cousins, and if they do end up deciding to trade him I do not think it will be to the Lakers. Too much bad blood there and it’s not like the Lakers are offering the best package either. Do not believe anything you read in the days leading up to the draft people! I really do still think the Sixers could very well take Emmanuel Mudiay here. They were the only team to scout him in China this past year (according to Chad Ford). Kristaps Porzingas is very much in play here as well, but who knows how much of the rumors the past month were just the Sixers trying to play the field and bait someone to want to trade with them. C’mon, it wouldn’t be the draft if the Knicks got the player they wanted at the fourth pick. The Knicks would probably trade back at this point and target Frank Kaminsky later in the lottery. If they stay put I think Porzingas would be a great fit in the triangle three years from now, but the Knicks are in as much of a win-now mode as they can be. Imagine the criticism if they take Porzingas? Porzingas fits very nicely into what the Magic are trying to do at this point in their rebuild: start to be on the upswing and try to be competing for a championship in about three years. Porzingas might just need that long to show his true potential. This is the ideal pick for the Magic at No. 5. This is again the ideal pick for the team picking here. They get the best player available at No. 6 while also filling a huge need on their team. I just can’t believe a player is going to fall his far who just last year was projected to be a top 3 pick. The Nuggets can literally go in any direction with this pick, making it no fun at all to predict. I do believe its between Winslow and Hezonja here and with Winslow gone that leave the sharpshooter from Croatia. I wouldn’t be surprised if they end up trading back if they don’t really like anyone still on the board. This is where the fun really begins. Detroit needs shooting and might try to fill their need at small forward with a player like Dekker. According to Chad Ford, Dekker shot the ball extremely well in his workout for the Pistons and Stan Van Gundy really likes this kid. If Dekker doesn’t go here he may slide all the way to the mid teens. Stanley Johnson and Devin Booker may be in play here as well. After all of the trades happening the past few days involving the Hornets I am not really sure who is even on this team right now. I know they do have Kemba Walker and Al Jefferson as their cornerstones. I think they would like to target a shooter unless someone else super talented falls to them. They might also trade back. I like Booker on this team, but Frank Kaminsky is definitely in play here as I believe he can be a good fit next to Al Jefferson. Can the Hornets really draft another power forward in the first round? The Heat can also go in many directions with this pick. I think if they had the chance to get a player that could potentially replace Luol Deng they would take that chance. Willie-Cauley Stein, Myles Turner and Kaminsky would definitely be an option here as well. So I know Larry Bird said WCS is going to be 100 million dollar player in this league, but a recent ankle injury that hasn’t healed the way NBA doctors would have liked is giving teams concern (according to Chad Ford). They may very well select WCS here, but I think they like Cam Payne too much and want to make the switch to a smaller, faster team next season. The Jazz have the luxury of taking the best player available here at No. 12, and with WCS still on the board they might be able to move back and acquire more picks. Kaminsky would be a great fit since they already have a WCS-ish player in Rudy Gobert. As I said I don’t think WCS falls this far, but I do think he will fall into the 6-11 range because of his past ankle injury that has not healed the way NBA doctors would have liked. The Suns have many options here, but they would almost be forced to take WCS if he is still here. Look out for them taking Turner or Trey Lyles here. Oklahoma City would love Cam Payne to fall to them here, but I don’t think he does. They would settle for a talented big man who can stretch the floor and block shots in Turner. Trey Lyles would also be an interesting fit here as well. The Hawks may be looking for a replacement for Paul Millsap and you know exactly what your going to get with Portis: a big guy whose solid at everything. This team is still trying to win now so getting a player who can contribute meaningful minutes in the playoff is crucial. Lyles also an option here. The Celtics will probably not be picking here so this seems like a waste of time. The best player left on the board is clearly Lyles. I do not think Lyles will fall this far, it just depends who actually ends up picking where in the first 15 picks. Find the next long and lanky player on the board and the Bucks will probably draft him. They could use some help down low as well as a good shooter. R.J. Hunter is in play here, but I think they try to bolster their front court. Lyles would be ideal, but I can’t see him falling to No. 17. The Rockets will almost certainly be selecting between Jones, Delon Wright and Jerian Grant. Grant would be an interesting fit on this Rockets team as he is big and can play off the ball. I think Jones, even though small, makes up for his size with intangibles that many teams in the late-to-mid first round really like. I’ve heard Martin had a great workout and the Wizards are really trying to find a stretch four that can play next to Gortat. With Lyles, Portis and Looney all off the board I wouldn’t be surprised if the Wizards take a player like Martin. Rondae-Hollis Jefferson and R.J. Hunter would be interesting choices here. A small forward is exactly what this team has been searching for and maybe the best perimeter defender in the entire draft falls to them at No. 20. The Raptors might also decide to go with a backup backcourt player like Hunter, Grant or Kelly Oubre. The Mavs team seems to change drastically every summer so they will probably try to fill the need of point guard. Grant has the potential to be a very solid combo guard in this league. Hunter, Oubre and Justin Anderson might be chosen here as well. I really like Anderson and think he will be a starter in this league someday. He has the makings of a great 3-and-D guy who would fit nicely next to Derrick Rose and Jimmy Butler on this Bulls team. Even though this Bulls teams is going to favor their offense much more than they have in the past I am not sure they can pass on Anderson if he’s still available. Hunter and Oubre would be interesting fits. I also really like Hunter who I do not think will fall this far on draft night. Hunter can shoot it with the best of them in this draft and will be a solid professional. His lack of size worries team, but I think that is something he will work on. The Blazers have a big summer ahead and taking the best player available just makes sense for them. Watch out for Oubre and Delon Wright here. This guy is a big wing who has all of the potential in the world. I have to believe a team higher than No. 24 takes a chance on him. If he was to fall I am not sure the Cavs could pass on a guy who if he figures it out could be a great pick this late in the first round. I think the Grizzlies target shooting here and call it a day. Easy as that. It has been a need of their for seasons now and picking in the late first round gives them a great chance to get the one-skill guy they’re looking for. I could also see the Grizzlies considering Anthony Brown, Joseph Young and Delon Wright. The Lakers will have probably already taken Okafor so they would be looking for help on the wing. If a trade doesn’t happen the Lakers will have Swaggy P and Jordan Clarkson plus whoever they think they can sign this summer (cough cough Rondo). So it makes sense for them to try to draft someone not the wing who is athletic and can defend. Insert Connaughton. They might also consider Young and Montrezl Harrell. Again, the Celtics will probably not be picking when the No. 28 pick is on the clock. If the Celtics did still own this pick Rashad Vaughn would be a great choice this late in the first round. He has NBA size and can really score. As a Nets fan I pray a player like Delon Wright falls to Brooklyn at No. 29, but I don’t think he will. I also am no longer sure if the Nets will be picking here. I could see them trading a player like Mason Plumlee with this pick to move up into the teens for a player. I could see Harrell, Chris McCullough or Guillermo Hernangomez going here. The Warriors will have many options when they are on the clock with the last pick in the first round. I think Anthony Brown fits into what they want to do as he is a solid defender who can knock down the 3-pointer. The Warriors may also look to find David Lee’s replacement at power forward here. Harrell, Richaun Holmes and McCullough would be in play here. This entry was posted in Draft / Offseason, Home, NBA and tagged 2015 NBA Draft, 2015 NBA Mock Draft, DeMarcus Cousins, Fan Operated Mock Draft, Joey Zocco, Jordan Katz Mock Draft, Lakers, Mock Draft 2.0, NBA, NBA Draft, NBA Mock Draft, ZML, Zocco's Modern Life. Bookmark the permalink.